The acquisition and processing of the Jaszczak phantom is a recommended test by the American College of Radiology for evaluation of gamma camera system performance. To produce the reconstructed phantom image for quality evaluation, attenuation correction is applied. The attenuation of counts originating from the center of the phantom is greater than that originating from the periphery of the phantom causing an artifactual appearance of inhomogeneity in the reconstructed image and complicating phantom evaluation. Chang's mathematical formulation is a common method of attenuation correction applied on most gamma cameras that do not require an external transmission source such as computed tomography, radionuclide sources installed within the gantry of the camera or a flood source. Tomographic acquisition can be obtained in two different acquisition modes for dual-detector gamma camera; one where the two detectors are at 180° configuration and acquire projection images for a full 360°, and the other where the two detectors are positioned at a 90° configuration and acquire projections for only 180°. Though Chang's attenuation correction method has been used for 360° angle acquisition, its applicability for 180° angle acquisition remains a question with one vendor's camera software producing artifacts in the images. This work investigates whether Chang's attenuation correction technique can be applied to both acquisition modes by the development of a Chang's formulation-based algorithm that is applicable to both modes. 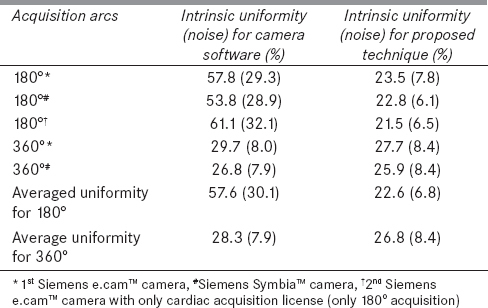 Assessment of attenuation correction performance by phantom uniformity analysis illustrates improved uniformity with the proposed algorithm (22.6%) compared to the camera software (57.6%). To evaluate the uniformity, contrast and resolution performance of gamma camera in tomographic mode, acquisition, and processing of a Jaszczak phantom is an important step. The American College of Radiology requires acquisition of the phantom as a part of semi-annual performance testing for tomographic accreditation of a gamma camera. The phantom is filled with 10–20 mCi of technetium-99m (Tc-99m) diluted in water and imaged by the gamma camera in tomographic mode for a certain total number of counts. Attenuation of photons originating from the cylindrical Jaszczak phantom causes artifactual inhomogeneity in the reconstructed count distribution as a function of radial distance with appearance of reduced counts at the center and an increase in counts toward the periphery [Figure 1]. This is caused by the increased attenuation of photons originating from the center of the phantom compared with those originating near the periphery. Chang's method is a well-established attenuation correction technique, originally derived for attenuation correction of uniform attenuating media in 1978 that remains applicable for evaluating modern gamma cameras. Though producing fairly uniform cylinder with constant attenuation for full angular acquisitions (360°), the results are less than satisfactory for partial angle (180°) acquisitions as used for cardiac single-photon emission computed tomography (SPECT) imaging [Figure 2]. Thus, this work explores the plausibility of applying Chang's attenuation correction for partial angle acquisition of the Jaszczak phantom. By comparing the application of Chang's attenuation correction on reconstructed Jaszczak phantom images acquired in 180° and 360° angles, optimal results were obtained for 360° acquisition [Figure 2]a while the results were suboptimal for 180° angular acquisition [Figure 2]b. This work investigates whether Chang's original technique suffices for attenuation correction of Jaszczak phantom image obtained by 180° and 360° angular coverage of the phantom by the detectors. The deluxe flangeless Jaszczak phantom  with solid spheres and solid rods was filled with water and 20 mCi of Tc-99m and mixed well for uniform distribution of radioactivity. Care was taken that no air bubbles were left in the phantom. The phantom was placed in the patient table of Siemens e.cam TM and Siemens Symbia ™ (n = 2) (Siemens Healthcare GmbH, Henkestr. 127, 91052 Erlangen, Germany) (n = 1) dual-head gamma cameras centered both in lateral and axial directions., A total of 3 scans were done at 180° orbit acquisition mode and 2 scans at 360° orbit acquisition mode. Thirty-two million counts were acquired for both 360° and 180° orbit acquisition modes. For 180° orbit acquisition mode, detectors were placed at 90° rotating from left lateral to right lateral position [Figure 3]b which allowed acquisition of 180° projection data with 90° gantry rotation. The detectors were placed at 20 cm from the center of the gantry and counts were acquired for 60 angular projections (3° angular sampling) in step and shoot mode with 32 million counts acquired in total in a circular orbit. The time of acquisition for each projection is calculated by dividing the 32 million counts by the count rate (counts/second) of the detectors and the total number of projections (60) with the phantom in the field of view. A 15% energy window was used, and the images were acquired in 128 × 128 acquisition matrix with a zoom of 1.45. For 360° orbit acquisition mode, detectors were placed in the 180° [Figure 3]a which allowed acquisition of 360° projection data with 180° gantry rotation. To improve image quality, a noncircular orbit is selected for acquisition allowing the detectors to come as close to the phantom for improved resolution and contrast performance. The images were acquired in step and shoot mode for 128 projection angles (2.8° angular sampling) with 250 K counts acquired at each projection for a total of 32 million counts. A 15% energy window was used, and the images were acquired in 128 × 128 acquisition matrix with a zoom of 1.45. Reconstruction of the projection data was performed using the filtered backprojection technique available in the e.cam software. A Butterworth filter (order: 6, cutoff: 0.55) was applied to the projections obtained from both acquisitions. Reconstructed transaxial slices were attenuation corrected by Chang's attenuation correction technique as implemented in the camera software. Reconstructed noncorrected images were also attenuation corrected by a modified Chang's attenuation correction technique. For a point source at coordinates (x0,y0) within a material of uniform linear attenuation coefficient (μ/cm), Chang  defined the attenuation correction factor for recovering counts attenuated by the intervening material by Equation 1. 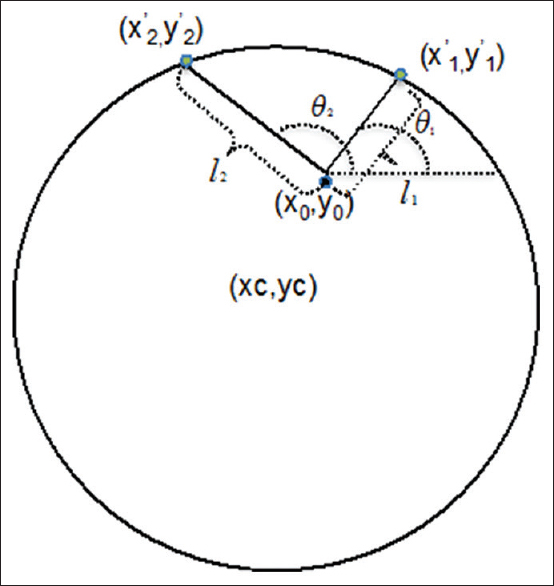 Where M is the total number of projections in a 360° scan and li is the distance of the point source (x0,y0) to the boundary of the surface at projection angle θi[Figure 4]. Correction of the reconstructed image with the above attenuation factor is the first-order correction referred as Chang's order 0. In the successive step, the first-order corrected image is forward projected using an attenuating media and is subtracted from original projected image to obtain an error projection. The error projection is back projected, and first-order corrected and added to the original first-order corrected image. The image thus obtained is second-order correction and referred as Chang's order 1. This process can be repeated for increased orders. In a modified technique called Moore's method which is same as Chang's method for first-order correction, a damping factor is multiplied to the reconstructed error image before adding to the first-order corrected image to obtain the reconstructed second-order corrected image. This reduces the least square error between original projection and re-projection from next iteration. Both methods were shown to improve attenuation correction accuracy for 360° acquisition with fewer iteration (1–2 iterations) while for 180° acquisition, Moore's method was more accurate. The comparison of forward projection data with the acquired projection data requires the availability of the original projection data which is inaccessible without vendor intervention, thus the only attenuation correction technique used for this work is Chang's order 0 which is also the only technique available in the camera software. For estimating the attenuation correction factor (li in Equation 1) for all angles around the phantom (number of angular samples M'), the attenuation path length is defined in this study for each point locations (x0, y0) inside the phantom. Initially, the phantom center (xc,yc) and radius (r) is defined from the transaxial slice of the Jaszczak phantom with ImageJ software. The boundary points of the Jaszczak phantom image were defined by the pixels whose coordinates (x'i, y'i) satisfies Equation 2. The boundary points of the circular Jaszczak phantom (total M') are considered to represent the 360° arc around the phantom. For all points inside the phantom, the correction factor for attenuation correction of counts at pixel coordinate (x0, y0), c(x0, y0) is computed by Equation 3. As the SPECT projection data system is acquired in broad-beam geometry instead of narrow beam geometry, the attenuation coefficient (μ) utilized (0.12/cm) is less than the attenuation coefficient calculated (0.155/cm) for narrow beam geometry., The correction factor calculated from Equation 3 is utilized to obtain attenuation corrected image from noncorrected image as illustrated in [Figure 5]. The angular span for calculating the attenuation coefficients (Equation 3, M') is independent of the angular coverage of the detector around the phantom. That is, M' in Equation 3 is always spanning 360° angles independent of whether 360° or 180° angular coverage was used for the acquisition. This is different than the current method of calculating attenuation coefficients where M' is same as M over the same total angular coverage as those for the acquisition of the phantom contributing to regional inhomogeneity for 180° acquisition [Figure 2]b. For evaluating the quantitative accuracy of attenuation correction, integral uniformity and noise of the phantom region from postreconstructed and attenuation corrected images were evaluated. One circular region of interests (ROI) of 20 cm diameter was drawn in average of 5 transaxial slices (total 16.5 mm slice thickness) from the uniform part of the phantom at the center for the reconstructed images obtained from 360° to 180° acquisition. The ROI mean counts (CountsMean), standard deviation (CountsSD), highest (pixel_cntmax) and lowest (pixel_cntmin) pixel counts were estimated. The intrinsic uniformity is calculated by Equation 4 and noise is calculated by Equation 5. The attenuation corrected image of the Jaszczak phantom obtained by applying the correction factor (Equation 3) to the non-corrected image is shown in [Figure 6] for both (a) 360° and (b) 180° acquisitions. The results illustrate uniform attenuation correction for both acquisitions. Uniformity and noise analysis results as illustrated in [Table 1] demonstrate comparable uniformity and noise for 360° acquired phantom images attenuation corrected by the vendor technique (28.3% and 7.9%) and the proposed technique (26.8% and 8.4%). The difference in uniformity for 180° acquisition between the proposed technique (22.6% and 6.8%) and the vendor technique (57.6% and 30.1%) was more substantial. Definition of phantom boundary is user-dependent that may make the attenuation correction results subjective. A more robust way is to define the boundary automatically using the weighted 1st or 2nd order derivative. Future work will involve automatic boundary detection of transaxial images making the attenuation correction process user-independent. The Chang's attenuation correction technique can be used for attenuation correction of noncorrected Jaszczak phantom image independent of the 180° and 360° angular coverage of the phantom by the detectors. Biodex, Flangeless Deluxe PET, and SPECT Phantoms. Available from: http://www.biodex.com/nuclear-medicine/products/pet-positron-emission-tomography/pet-phantoms/flangeless-deluxe-pet-and-sp [Last accessed on 2015 Nov 29]. American college of radiology. Nuclear Medicine Phantom Instructions. Available from: http://www.acraccreditation.org/~/media/Documents/NucMed-PET/Nuclear-Medicine-Forms/SPECTPhantomInstructions.pdf?la=en [Last accessed on 2015 Nov 29]. Chang LT. A method for attenuation correction in radionuclide computed tomography. IEEE Trans Nucl Sci 1978;25:638-43. Garcia EV, DePuey EG. Updated imaging guidelines for nuclear cardiology procedures. Part 1. J Nucl Cardiol 2001;8:G51-8. LaCroix KJ, Tsui BM, Hasegawa BH. 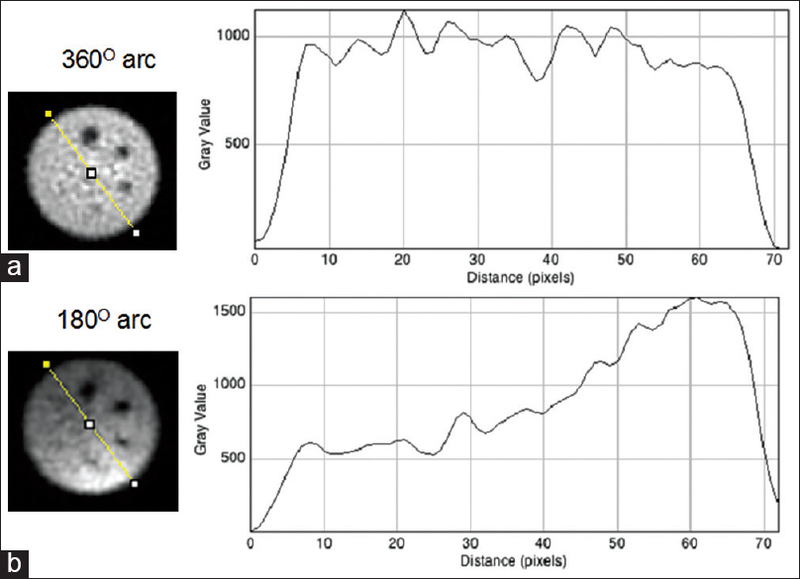 A comparison of 180 degrees and 360 degrees acquisition for attenuation-compensated thallium-201 SPECT images. J Nucl Med 1998;39:562-74. Coleman RE, Jaszczak RJ, Cobb FR. Comparison of 180 degrees and 360 degrees data collection in thallium-20 1 imaging using single-photon emission computerized tomography (SPECT): Concise communication. J Nucl Med 1982;23:655-60. Go RT, MacIntyre WJ, Houser TS, Pantoja M, O'Donnell JK, Feiglin DH, et al. Clinical evaluation of 360 degrees and 180 degrees data sampling techniques for transaxial SPECT thallium-201 myocardial perfusion imaging. J Nucl Med 1985;26:695-706. Tamaki N, Mukai T, Ishii Y, Fujita T, Yamamoto K, Minato K, et al. Comparative study of thallium emission myocardial tomography with 180 degrees and 360 degrees data collection. J Nucl Med 1982;23:661-6. Siemens. Ecam variable angle eco. Available from: http://www.healthcare.siemens.com/refurbished-systems-medical-imaging-and-therapy/molecular-imaging-ecoline/spect-spect-ct-ecoline/e-cam-single-eco. [Last accessed on 2015 Nov 29]. Siemens. “Symbia E,” in SPECT and SPECT-CT, Edited by Siemens (Siemens). Available from: http://www.healthcare.siemens.com/molecular-imaging/spect-and-spect-ct/symbia-e. [Last accessed on 2015 Nov 29]. Moore SC, Brunelle JA, Kirsch CM. Quantitative multi-detector emission computerized tomography using iterative attenuation compensation. J Nucl Med 1982;23:706-14. Schneider CA, Rasband, WS. Eliceiri, KW. NIH Image to ImageJ: 25 years of image analysis. Nature Methods 2012;9:671-75. Lewis MH, Faber TL, Corbett JR, Stokely EM. Attenuation correction of SPECT: An evaluation of hybrid approaches. IEEE Trans Nucl Sci 1984;3:101-7. Harris CC, Greer KL, Jaszczak RJ, Floyd CE Jr, Fearnow EC, Coleman RE. 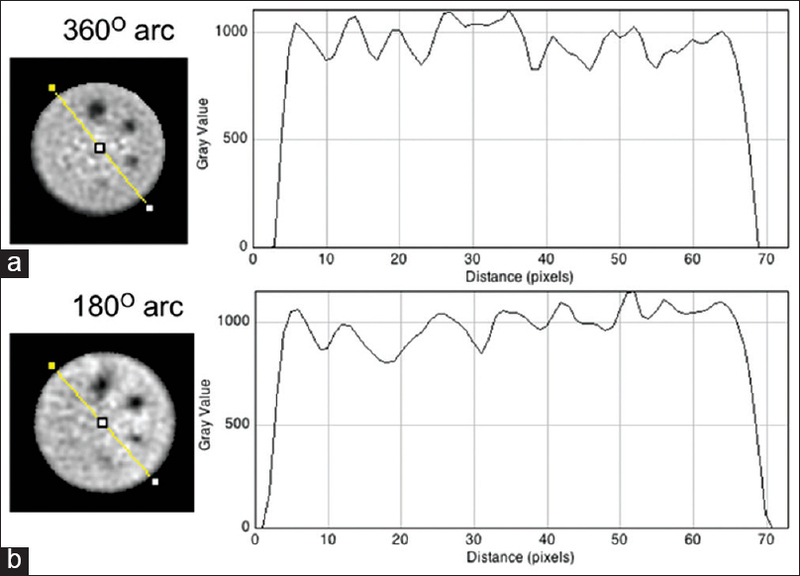 Tc-99m attenuation coefficients in water-filled phantoms determined with gamma cameras. Med Phys 1984;11:681-5.